Clark S. Edwards, Brevet Brigadier General, USA, Colonel of the 5th Maine Infantry autograph letter signed, 4 pages, 4to., Camp 5th Regt. Maine Vols., January 2nd. "... I shall be Col of the 5th. 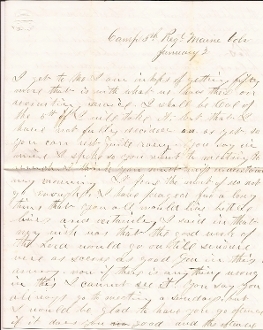 I will take it..."
Edwards continues his letter with news about a soldier who went to Washington to get his pay after he left the hospital but was stopped for his desertion and he had to come down here to get reinstated and his pay and show his discharge papers, mentions the new nasty postage currency, mentions a sutler who was to join the regiment, who says could make a lot as the boys buy from other sutlers, he states he could help the sutler get the position, etc. The 5th Maine Infantry was a hard fought regiment participating in 22 battles from First Bull Run to Petersburg, including the Battle of Gettysburg.